The Visayas region will particularly feel the intensity of Ruby’s strong winds, heavy rainfall and possible storm surges as it makes landfall starting Saturday night or Sunday morning over the Eastern Samar- Northern Samar area. Its path would cross central Visayas before exiting Mindoro and into Philippine Sea on Monday. On PAGASA’s reports as of 11 pm Friday, Ruby currently has strength of 195 kph maximum sustained winds, so a storm signal number four would be raised on cities and provinces in its direct path. In addition, the typhoon slowed down towards west at 10 kph which would further prolong rain, winds and storm surges. 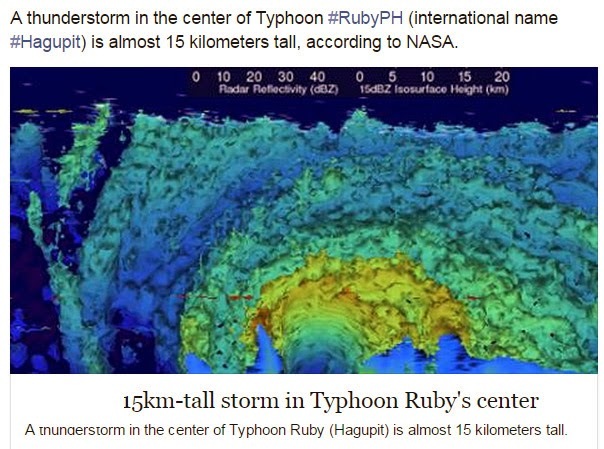 "The GPM satellite flew almost directly above dangerous typhoon Hagupit on December 5, 2014 at 1032 UTC as the typhoon was approaching the Philippines. The GPM Microwave Imager (GMI) instrument measured rain falling at a rate of over 76 mm (almost 3 inches) per hour in the typhoon's eye wall. In a report by Hawaii-based Joint Typhoon Watch Center (JTWC), Ruby has further strengthen and falls into the category of a super typhoon. JTWC predicts that by Saturday, Ruby would reach its peak at 250 kph with a ten-minute sustained winds and 305 kph gusts. The Japan Meteorological Ageny (JMA) in Asia-Pacific also raised the said typhoon’s status to ‘violent typhoon’. Post by Precipitation Measurement Missions. Although many felt relieved that the storm has weaken, US weather forecasters assume that the typhoon only underwent an eyewall replacement cycle but strengthened once again after gaining a new eyewall. Meanwhile, reports of panic-buying and forced evacuation had been surrounding many areas of Eastern Visayas, the same region that was devastated by super typhoon Haiyan a year ago. President Benigno Aquino has ordered vigilance from all concerned local government unit to prevent or even minimize the impending disasters and threats by the storm. 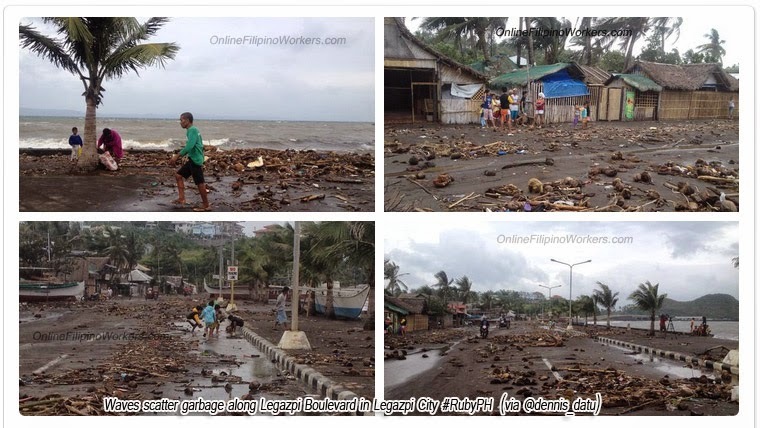 Netizens, on the other hand, had been circling prayer brigades all-over social medias like Twitter and Facebook for divine intervention against the storm.